This is where you tell the gadget the address and credentials to use when connecting to Virtual Radar Server. Enter the network address of the server here. The network address can be found on the Main Screen of the web server. The address must include the /VirtualRadar part at the end of the address - so if the IP address of the computer running virtual radar is 192.168.1.14 and Virtual Radar Server is listening on port 8080 then the full address for the gadget would be http://192.168.1.14:8080/VirtualRadar. 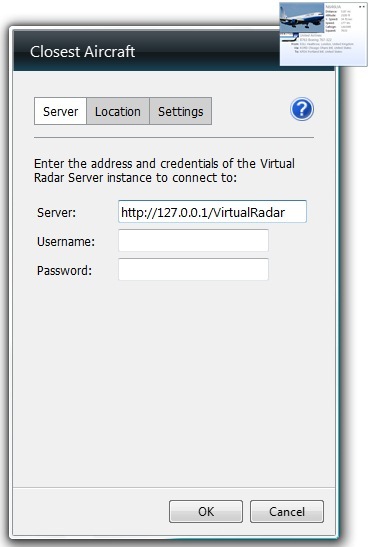 The default address is http://127.0.0.1/VirtualRadar, which is the address to use if Virtual Radar Server is running on the same computer as the gadget and the port specified when installing Virtual Radar Server was left at 80. If you have configured Virtual Radar Server to require a username and password in the Web Server Options screen then you must enter the username and password here. If you don't then you will either get a "Cannot Connect" message or a "401 - authorization required" message. The gadget's docked view will only report "Cannot connect" but the flyout view will show the full message.